This colloquy will gather 14 teachers who are in their mid-years of teaching, from the granting of tenure (or its equivalent) to the last decade or so before retirement. This period in a teaching career presents its own particular challenges for teaching and learning. This is a time when reflection can help mid-career faculty to identify possibilities, renew commitment, venture in a heretofore unconsidered direction, and compose a more clarified sense of self and purpose. Now that I have given myself to the teaching life, do I like who I have become or who I am becoming? Have I found my voice in the classroom, in my scholarship, at my institution? Or have I lost interest in the intellectual expressions of my discipline, my institution, or the vocation of teaching? Now that I have gained distance from my teachers and mentors, how have I charted my own vision of the teaching life in terms of my pedagogy, my scholarship, and involvement in my institution? In what ways am I yet expressing the gratitude and/or grief of the doctoral formation process in my vocational identity? In what ways do I sense my unique contribution to the classroom, my discipline, and my institution? Or is the uniqueness of my voice absent or weak in one or more of these crucial sites? Where is the dream now, for my teaching, my scholarship, or my institutional life? What are the projects that now I am prepared to imagine that will demand all my wisdom, experience, and skill? If here is no dream now, what does that mean? Where do I want to take the students with the art of teaching? Is it the same places I have grown accustomed to taking them and do I remain satisfied with the destination? Or are there new places I want to go and have them go with me? Do I sense generational, cultural, theological, political, and ideological differences from my students and what does that mean for my life as their teacher? Is the health of my institution such that I will have to imagine taking on a greater leadership role or must I now begin to imagine the teaching life apart from my institution or even apart from a foreseeable teaching position? Participants will receive a stipend of $3,000 for full participation in the three sessions, plus local expenses and travel. Please Note: U.S. Law prohibits the Wabash Center from paying stipends to participants with certain classes of foreign national status. The Wabash Center is, however, able to reimburse ALL participants for travel and other expenses. Immigration status has no bearing on the Wabash Center’s selection of participants. It impacts only our ability to pay these participants a stipend. We deeply regret these restrictions but are confident that participants who are not eligible for a stipend will nonetheless find our programs valuable even without a stipend. Participants will be eligible to apply for a follow-up grant or fellowship of $1,000 for deepening a sense of artistry or spiritual direction tied to teaching and learning. Details will be provided during the colloquy. Front Row (left to right): *Amy Oden (Wesley Theological Seminary), Craig Satterlee (Lutheran School of Theology at Chicago), Rollin Ramsaran (Emmanuel School of Religion), Fred Edie (Duke Divinity School), Julia Speller (Chicago Theological Seminary), Lai Ling Elizabeth Ngan (Truett Theological Seminary of Baylor University). 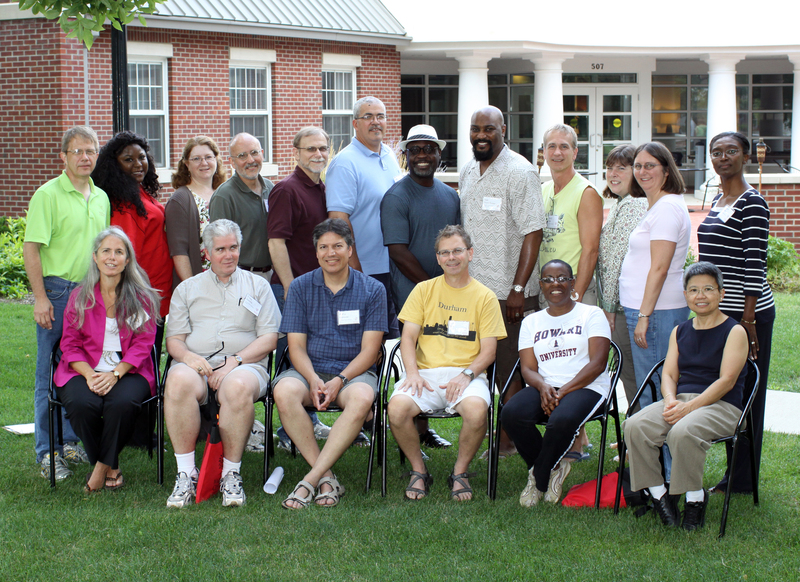 Second Row: *Paul Myhre (Wabash Center), Stacey Floyd-Thomas (Vanderbilt University/The Divinity School), Carol Bechtel (Western Theological Seminary), *Robert Pazmiño (Andover Newton Theological School), Klaus Issler (Talbot School of Theology/Biola University), Bruce Fields (Trinity Evangelical Divinity School), *Willie James Jennings (Duke Divinity School), Juan Floyd-Thomas (Vanderbilt University/The Divinity School), David Johns (Earlham School of Religion), Lisa Withrow (Methodist Theological School in Ohio), Ruth Anne Reese (Asbury Theological Seminary), Mignon Jacobs (Fuller Theological Seminary). Not Pictured *Virginia Wiles (New Brunswick Theological Seminary).